Oak laminate bring that fresh Scandinavian aesthetic into the master bedroom and walk-in wardrobe. 5: Select your block and unit at the HDB headquartersGot your checklist of potential units? Good. It’s time to make your way down to the HDB headquarters to book your flat. Other things to have ready for your appointment:Birth certificatesMarriage certificate (if you’re married)Income documents for your HLE and grant applications (see point four)HLE approvalEnough money (to be paid in cash or through NETS) for your option fee that can range from $500 to $2,000For more information read here During your wait you can head to a small exhibition that showcases the tiles, floors and doors for your unit. Under the Optional Compotent Scheme (OCS), you have the option of doing away with these items and installing your own when renovating. 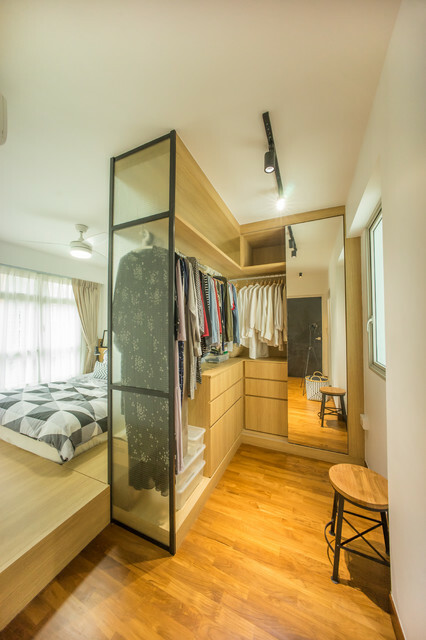 While it’ll bring down the purchase price of your flat, it will bring up the cost of your renovation.At this point you’ll meet your housing officer who will run through the available grants and the details of your HDB Loan Eligibility Letter (HLE). All this contributes to the all important purchase price of the flat.